Access: Day Mountain parking area along Route 9 east of Seal Harbor. Length: Roughly 1 mile from trailhead to Hunters Beach (one way). Elevation Change: 250-ft gradual descent to Hunters Beach. The Day Mountain parking area is located just outside of Acadia National Park, along the southern loop of Route 3 roughly .8 miles east of the town of Seal Harbor. Park in the small lot on the south side of the road; the start of the Lower Day Mountain/Hunters Cliff Trail is right in the parking lot. (Across the road heading north is the Day Mountain Trail into Acadia National Park.) Hike south along the forested trail and within minutes you will be at the top of Lower Day Mountain; this "mountain" is barely a hill and does not have a summit marker. The trail continues southeast crossing Cooksey Drive and makes a slow descent to the cliffs above the Atlantic Ocean. 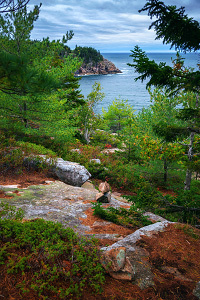 The main Hunters Cliff Trail doesn't actually get too close to the water; it veers northeast along the forested cliffs and descends to meet up with the Hunters Beach Trail at Hunters Beach within the boundary of Acadia National Park. But at the spot where the trail is closest to the shore, it is easy to leave the trail and explore the rocky coastline. 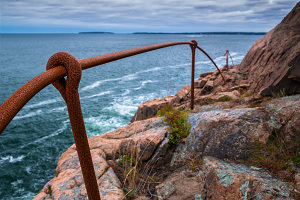 Several rusted out old railings are evidence of an old trail along the cliffs, but this is not the current trail and exploring sections of the old trail can be a bit treacherous; the railings are not to be trusted. When you are done exploring, make your way back to the main current trail to continue your hike. 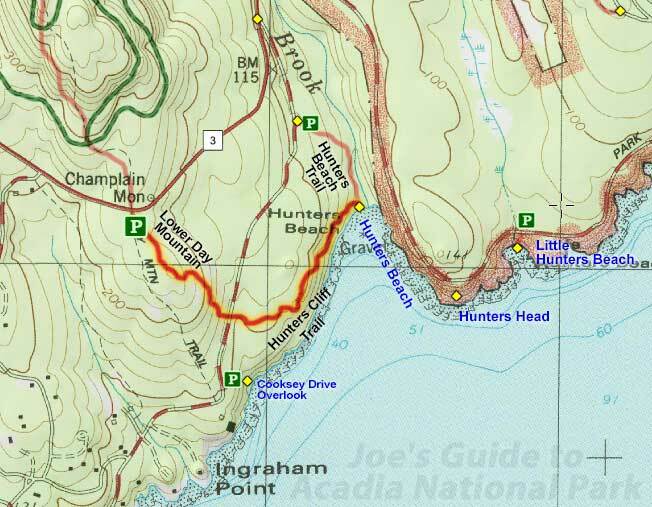 While this trail might not be as stunning as Ocean Path within Acadia National Park, this is a fun little hike that traverses some pleasant and lesser-visited scenery and offers an alternative route to Hunters Beach. When exploring the cliffs, please take great care as there are some steep and sketchy spots especially near the abandoned trail railings.